To choose relevant links for planning and enjoying your trip to Austria, our website provides you with a link directory consisting of valuable internet references around the topic of Salzburg. You are looking for more information on the Salzkammergut? A biography of Wolfgang Amadeus Mozart? Hiking routes in the alps? Or a bit of background info on the making of ′The Sound of Music′? No matter what you are looking for, our extensive link collection will meet your needs! For more information on pages collaborating with us, click here. Taxi services, airport transfers, chauffeured cars. Mozart Portal of Barenreiter, publisher of "New Mozart Edition"
Lodging in Brussels for less than 50 EUR per night. Discount Budapest hotels under 50 EUR per night! Accommodation in Budapest for less than 50 EUR per night. Lodging in Madrid for less than 50 EUR per night. Cheap accommodation in Milan, Milan hotels under 50 EUR per night! Milan hotels under 50 EUR per night. Book now and save! Ski holidays to Europe, Accommodation in European ski resorts. 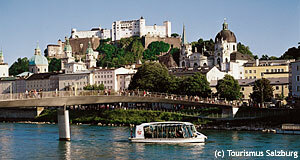 You will find here all bed and breakfast accommodations and vacation apartments in Salzburg and the Salzberg province. Natural history museum "Haus der Natur"